NEW YORK—A report was released on Wednesday after community groups surveyed residents living in New York City Housing Authority (NYCHA) apartments following Hurricane Sandy. The report showed that many of the buildings were in desperate need of repairs even before the storm, and existing problems worsened afterwards. Residents said that there was weak response from the government to address these issues. The report was a joint effort by several community groups. They surveyed nearly 600 residents living in NYCHA buildings in Sandy evacuation zones. NYCHA buildings in Coney Island, the Rockaways, Red Hook, and Lower Manhattan were most heavily impacted. Fifty-five percent of those surveyed said that they needed repairs in their apartments before Sandy hit, and 40 percent needed new repairs after the storm. Some of the top apartment repair needs before Sandy included mold, painting, bathroom repairs, broken appliances, and leaks. In the month prior to Sandy, there was a backlog of 330,000 repairs. Hurricane Sandy brought about more problems. Permanent boilers were damaged in the storm. Temporary boilers that were set up broke down easily, resulting in sporadic heat and hot water availability. The mold problem became worse. Before Sandy, 34 percent of surveyed residents had visible mold in their apartments. After Sandy 45 percent of residents reported visible mold. Of those that reported the mold problem, 34 percent said that NYCHA cleaned up the mold poorly and 38 percent said NYCHA did nothing at all. Mold can cause health issues such as asthma, bronchitis, and allergies. Fifty-six percent of those who reported mold said that it has affected their health. Yet more problems meant more backlog. More than half the residents who reported problems were told they needed to wait six months before repairs can be done. “We are still living in the aftermath of Sandy. Many of the residents of public housing are still living with many, many issues that are hindering them, especially with their health,” said Pastor Duane Sleet, First Baptist Church of Far Rockaway. The report points out that NYCHA has long-standing financial problems that contributed to the delay of repairs. Insufficient funding from the federal government and mismanagement of existing funds are two reasons attributed to NYCHA’s estimated deficit of $78,000,000 for 2014. 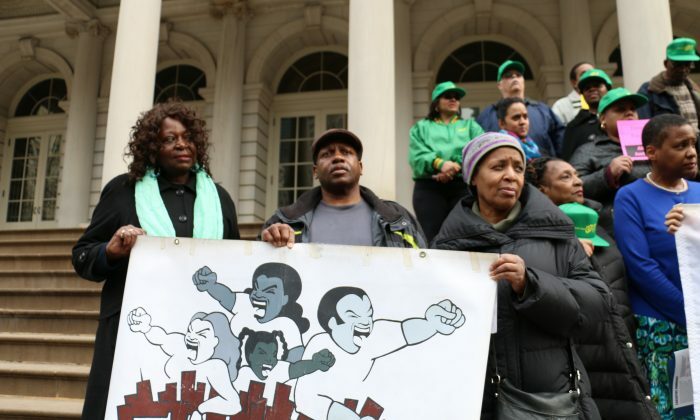 Even before Sandy, NYCHA was seeking ways to cut back services and raise revenue. One of the ways was to delay repairs. In February, Mayor de Blasio set aside $52.5 million in his preliminary budget for outstanding work orders. NYCHA has been paying the NYPD approximately $70 million annually for police services at NYCHA facilities. The preliminary budget relieved NYCHA of the remaining $52.5 million that would have gone to the NYPD in 2014. “Representatives from our groups had a meeting yesterday with the top people at NYCHA and a representative from the mayor’s office. We feel positive that they are ready to work with us and to address the long-standing problems that NYCHA has faced,” said Eugene Woody, member-leader with Community Voices Heard and a NYCHA resident. The report offered several recommendations on how to improve NYCHA housing conditions. NYCHA should thoroughly tackle the mold problem by fixing infrastructure, such as leaking roofs and old pipes. Each month, NYCHA should make public the list of outstanding repairs in each building and update it monthly. NYCHA should replace temporary boilers and move all boilers and critical wiring systems to higher ground. Yi Yang is a special correspondent in New York.